Angry Robot Books revealed the cover to Lavie Tidhar's forthcoming steampunk novel The Bookman due for relaease in the UK/Australia on Jan. 7, 2010 and in October 2010 in the US/Canada. It seems the steampunk movement is gaining momentum. Not feeling the love for this cover. A brilliant criminal stalks the streets of London. Scotland Yard is on his trail. But how can the city remain safe when every book is a potential weapon? I admit I'm not feeling the love for the cover either. I think they definitely could have taken it in a slightly darker realm and not given it such a 'comicky' feel. Especially as I finished the book recently and yeah. I thought at first I was looking at the cover for a new League of Extraordinary Gentlemen book! Toss aside your notions of right, wrong and literary masterminds because Tidhar takes those ideas and eats them for breakfast. 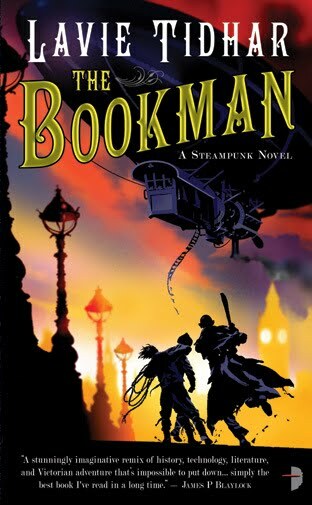 The Bookman serves dual purposes--for those who aren't quite as steep into steam punk, its a good primer for what steam punk can be like. For everyone else it takes literary masterpieces (and the minds behind them) and gives them a spin to explain the unexplainable. Two sentences...but its the best I can do XD plus I think my grammar is way off, so it probably could be one sentence if I tried harder. 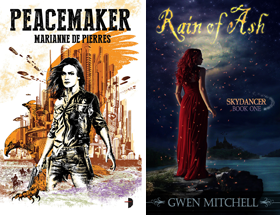 by the by, if you go to the publisher's website and join the 'army' you are given access to downloads of some of their current and forthcoming titles. The Bookman included. I'm in the middle of Winter Song, by Colin Harvey, at the moment actually and finished up Nekropolis a week or so ago. Hi Lexie - nice short summary, it sound like it is my type of book. Actually I am an army recruit but I haven't downloaded many as I haven't made that big step to an ereader yet. No I haven't gotten one either ::sigh:: its out of the budget range (unless I drop college XD) for now. I'm making do with ebooks on my computer for now. My eyes are slowly becoming more used to it! Lexie they are still kind of pricey in my opinion as well. I spend most of my day job at a workstation, add to that my blogging and reading on a computer just doesn't appeal. Beside the hard copy TBR pile os ready to topple and crash so I have no shortage of things to read much as some e-titles sound interesting.